What with one thing and another over the "stupid season", I haven't managed for the last couple of weeks to join in with my friends at I Heart Cooking Clubs where we are cooking the food of Madhur Jaffrey. Time now that all the busyness is out of the way to join back in. Our theme this week is "Appetisers", and it seemed like the perfect time to try this recipe for Sour Chickpeas that I've had earmarked for sometime now. These sour, spicy chickpeas are classic street snack food found all over northern India. 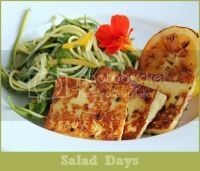 Madhur says, in her introduction to the recipe, "although Khatte Chhole are generally eaten as a snack in India, I serve them at my lunches and dinners, with vegetables, meats and rice". I'm inclined to agree. I enjoyed them as a bit of a snack served with some crisp triangles of toasted pita bread, but I liked them best over rice for a light lunch. Now, you will have observed already that this dish suffers photographically from the DBFS (dreaded brown food syndrome), but trust me when I tell you that it tastes a lot better than it looks. There is certainly plenty of spiciness in this dish, and the sourness (although I think initially somewhat foreign to European palates) works really well with the delightful nuttiness of some steamed Basmati rice. Put one of the chopped shallots in a small bowl, together with the chopped chilli, grated ginger, lemon juice, and 1/2 teaspoon of salt. Mix together well and set aside. Now heat oil in a heavy based, deep pan over medium heat. Once oil has heated, add the remaining chopped shallot to the pan and fry, stirring from time to time, until the shallot becomes fragrant and begins to turn golden brown. Add the chopped tomato and continue to cook for several minutes, stirring occasionally, until the tomato has "broken down", and has become like a thick sauce. Add the coriander, cumin and turmeric, and stir to combine everything well. Add the chickpeas to the pan, and stir to coat well with the spice and sauce mixture. Now add 400 ml (14 fl oz) of water, or reserved chickpea cooking liquid if you have it. Add the garam masala, cayenne pepper, and 2 teaspoons of salt. Stir to combine, and then bring up to the boil. Reduce heat to a simmer, cover and cook gently for about 20 minutes, stirring occasionally. Stir in the mixture of shallots, chilli, ginger and lemon juice. Mix well and remove from heat. Serve immediately, or cool to luke warm. (I actually liked it best at room temperature). I'm sharing this post at See Ya In the Gumbo hosted by the lovely Michelle at Ms. enPlace; at Gallery of Favourites hosted by the equally lovely April at The 21st Century Housewife and Alea at Premeditated Leftovers; and at My Meatless Mondays hosted by Chaya at My Sweet and Savory. Yum. Yes, it's brown, but I can imagine how great it tastes, especially at room temperature. Thanks very much for the link to Wild Things. I'm really enjoying it. Thanks, Sue, and I'm so pleased you're enjoying the link. Thanks Sue for your nice comment on my site and happy new year to you! Seriously, you are in summer temps now, right? It is 38 F (so about 3 3 C) and I am nursing a hot coffee while the heater drones on. Hi Tina. Yes, we are in summer here. Must say, I'm really surprised that your temps get that low - I thought Florida was just warm all year round. I think they look beautiful - the greens and reds in it are subtle but they are there! This sounds really delicious as I love sour Indian dishes. I'm planning to make them and I'll let you know how they turn out. Thank you so much - I hope you enjoy them. I love that sourness in many Indian dishes too, which is a quality we don't really get so much in many western dishes. Thanks, Rebecca, and thanks for visiting - hope you'll stop by again. Yes I also think that they would be perfect for a main with some rice and indian bread, enough for me :-). They sound delicious! We're eating more chickpeas these days and these sound like something I could rustle up and then have for lunch when I'm working from home. Hi Julie. I eat a lot of chickpeas too, and I've totally been enjoying them for lunch the last couple of days just scooping them up with chunks of pita bread. Could not get into your post the last two days! 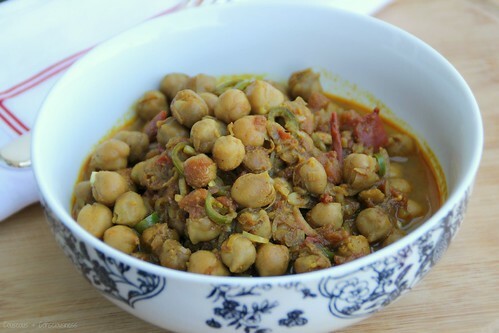 This sour chickpeas is one that I've bookmarked to try, (and many others!! ), this sounds right up my alley! I love chickpeas and could snack on these the whole day! What a delicious chickpea snack! I'll be eating these by the handful. Yum! Some of my favorite edibles are brown. Chocolate. Coffee. Beef gravy. But, yes, DBFS makes it difficult to take decent pics! Even though they are the dreaded brown, your chickpeas look quite good. Thank you for linking them this week. I did make these and they were lovely. My husband and I really liked the sourness.